During the phone conversation with the woman from New Mexico who read the Hatman script, she commented she could feel "faces" everywhere out there, which blew my socks off because as I explained to her, through the course of cruising around out there for month's I could sense the same thing, but nothing had turned up so far. We hung up and I went back to Google Earth, literally within 30 minutes one face after another began to reveal itself to me, which lasted for several days, like a door opened.......then as abruptly as it began........it suddenly stopped and no more faces. In Face 1 Image 1 below, I noticed what looked like wings again and then I noticed a body of some kind of animal. To me, it looks as if he is taking off in flight. I stood back from the computer screen and thought could he be a sphinx? And here we go with another hat again and it looks as if has a beard or goatee. From Wing tip to point of beard is 3.21 miles long and approximately 1.85 miles wide and sits 972 feet above the road. At first I thought no way, but as I enlarged the image I found another albeit a little distorted triangle extending from the throat. As you can see, in this configuration, from the look of his eye, it depicts he is up there in age from the "bags and wrinkles" below his eye. The Sphinx is facing SE. 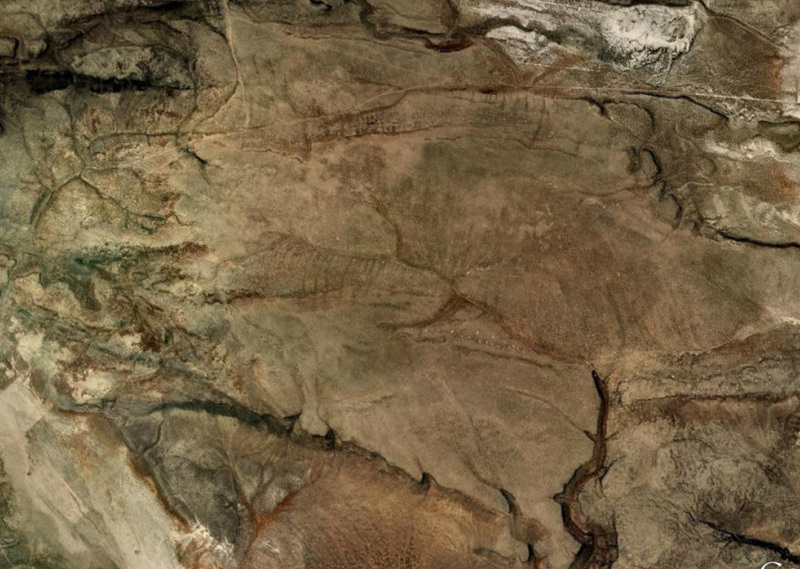 At the end of the Sphinx's wings is what looks like a wolf/shaman and it is 3.71 mi. in length. He is aligned NW, but faces NE. I found what sits on the tip of his tail extremely intriguing. Please ignore the diagonal lines, their purpose will be revealed as we go along. There is yet another extension or triangle at the throat once again. The second face is absolutely remarkable and faces northwest. From top of hat to chin it is 1.10 mi long. Interestingly enough, as you can see there is another triangle, but this time it appears to lie over the mouth instead of throat. See Face 2 Image 3 below for closeup. I tried to determine what culture he could relate with according to what appears to be a hat he is wearing, but could not find anything. Tri-Complex Directions.................The directions of these three configurations are all different. When aligned true North both faces are looking in the SE direction. Face 2 is facing directly south, but is looking to the SE. Face 1 is facing and looking to the SE. This direction is important as you will see later.